Based on your genetic make-up, EAT RIGHT 4 YOUR BLOOD TYPE means eating foods that are compatible with your individual chemistry. 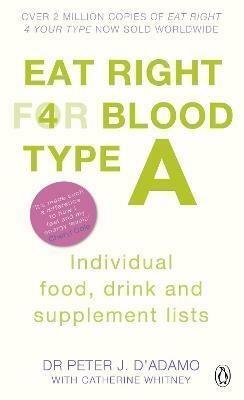 For example, if your blood type is A, then you will enjoy your best health on a vegetarian diet. Inside are comprehensive listings of what's right for Type A in all of the main food, drink and supplement categories, so you can avoid putting on those extra pounds or feeling unwell from eating the wrong thing. Dr Peter J. D'Adamo is a renowned naturopathic physician, researcher, and lecturer. Chosen as a Physician of the Year in 1990 by the American Association of Naturopathic Physicians, Dr D'Adamo is also the founder of The Journal of Naturopathic Medicine and frequently contributes articles to medical journals. His series of books have been translated into over 65 languages. He has been named the Most Intriguing Health Author of 1999, and his first book Eat Right 4 Your Type was voted one of the "Ten Most Influential Health Books of All Time" by industry analysts.